For product recommendations and technical, application and heat curing information contact Advanced Polymer Coatings’ customer service. Contact +1 440-937-6218. 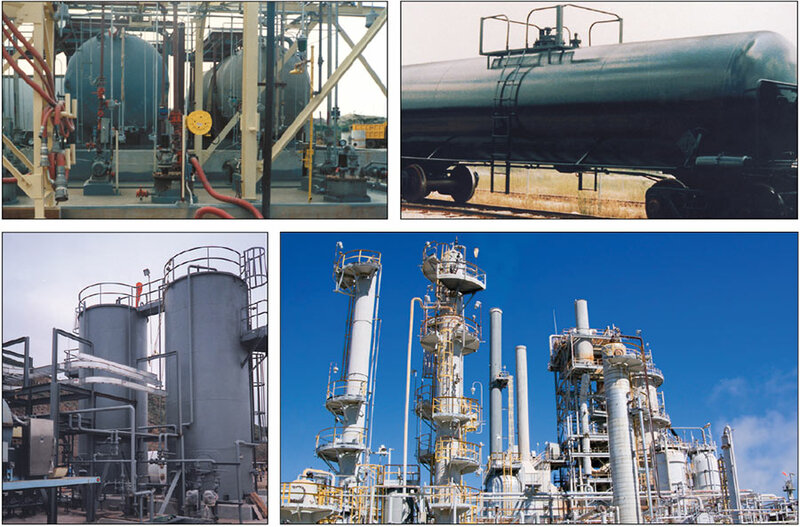 Chemical Processing - Tanks, vessels, hazardous waste, secondary containment, chemical plant floors, etc. Paper & Pulp - Digesters, black liquor tanks, bleaching, etc. Mining - Acid tanks, scrubbers, etc. High Technology - Clean rooms, floors, etc. Power Generation - FGD systems, ducts and stacks, etc. Waste Water - Tanks, clarifiers, flocculation basins, neutralization chambers, concrete containment, etc. Corrosion resistance data for Phenolic Epoxy, Vinylester and Stainless Steel from published literature. This is Only A Reference Guide. Contact your ChemLINE® Representative or the ChemLINE® Customer Service Hotline +1 440-937-6218 for detailed specifications prior to any final coatings recommendation or application. WHO: Matlack Leasing is a leading North American lessor of OTR tank trailers and tank containers serving tank operators, motor carriers, manufacturers, and chemical, petrochemical, agricultural, and environmental service companies. SERVICE: Matlack carries 30-70% Sulfuric and other acids, corrosives, hazardous waste, petroleum products, and chlorine. Customers want the ultimate in protection for these tanks, to prevent unwanted corrosion, to ensure product (cargo) purity, and to extend the service life of the units. HISTORY: Matlack has used a range of lining technologies such as rubber, fiberglass reinforced products, Kynar®, Teflon®, and other various epoxy and phenolic epoxy coatings. Each lining system has presented different challenges and no single lining was versatile enough to cover a wide breadth of cargoes carried. Some of these linings have also been very expensive to install and maintain. THE SOLUTION: Matlack now specifies the ChemLINE® tank lining to prevent unwanted corrosion to extend the service life of its tanks. ChemLINE® offers a superior solution at a competitive price and is versatile by being able to carry a large footprint of cargoes, including food grade products. Interior pitted tank with corrosion prior to ChemLINE® application. Finished tank with ChemChemLINE® coating. Manway lid showing corroded rubber lining, due to HCl exposure. Manway lid and surrounding spill area properly protected with ChemChemLINE® coating. For more than a decade ChemLINE® coatings have withstood the tremendous stresses and extremes of chemical attack and abrasive wear. ChemLINE® has been proven worldwide under the most arduous operating conditions, from resisting the most aggressive chemicals to handling hot pipelines in sub-freezing temperatures, with a history of success. Based on this experience, the development of ChemLINE® 784 HS represents a quantum leap in chemical resistant polymer coatings.